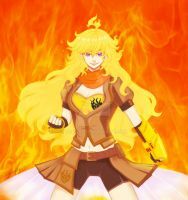 I praise you for drawing such an awesome Yang. Was very nice to catch you on stream, burbur. I'm not too familiar with RWBY but the character looks amazing. Great job drawing this beautiful girl and giving her the justice she reserves.